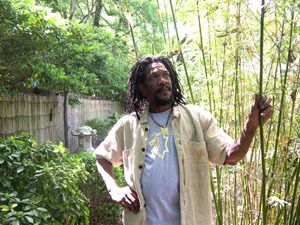 Lenval Jarrett (AKA Shayar) was born in Ocho Rios, St. Ann's Jamaica West Indies. He always had a natural inclination towards music, his father being one of his greatest influences. Shayar began piano in primary school around the age of 10 years. He eventually convinced his father to buy him a guitar around 12 years of age and decided to be a lifetime musician. He began playing around his hometown with local friends through out his teen years. The next stage of his music career led Shayar to begin playing the hotel circuit along the north coast of Ocho Rios. At the age of 19, the famous Jamaican producer Jack Ruby hooked Shayar up with Burning Spear, the Grammy winning reggae band. After this union, Shayar performed with Burning Spear throughout US and Canada for the first tour in 1976. All the while Shayar had his own visions and musical side projects. Shayar took part in the original SunSplash Reggae festival with Burning Spear. In 1984, Shayar chose to leave his home of Jamaica and journeyed to Brooklyn, NY. In NY he was a free lance guitarist and started a band called Crucial Force. While working in NY Shayar took a break from traveling with Spear to his focus on his musical vision. However in 1989 Burning Spear needed a rythym guitarist and he was available so he joined back up. He spent the next 7 years as Spear's full time rythym guitarist, and at the end of 1996 he felt that the circle had been completed and it was time for him to move on. At this point, Shayar started Krooshal Force, the continuation of old band with a new vibe. In 1998 he decided he needed the mountains and moved to Beckley, WV. In 2002 Shayar took some time to go on a European/US tour with Jamaican Reggae superstar Anthony B. The present version of Shayar and Krooshal Force is comprised of Wayne Shorter on percussion and Chris McCorkle on Bass. Wayne hails from Manchester, Jamaica and has played drums all over the world with many talented musicians. Chris is from Roanoke, Virginia. He studied jazz at the College of Charleston, SC and Virginia Tech. He was working as a freelance jazz bassist before joining Krooshal Force.